Verscio , a charming village typical of the canton Ticino situated near Ascona and Locarno, possesses a rare pearl that is unique in Ticino: a cultural centre of international standing and fame. A cultural centre that boasts a theatre school and a permanent theatre with two stages, a company and a museum. It is a special meeting place for established actors, performers making their début, theatre lovers, visitors of the museum, artists, people interested in culture and tourists from all over the world. One can also try various local specialities in the theatre’s restaurant while participating directly in the cultural and artistic lives of the people who fill the stage. In 1971 no permanent theatre existed in Ticino. For Dimitri and his wife Gunda this was a challenge and they decided to establish their own theatre in the centre of the village of Verscio. The Teatro Dimitri became the meeting-place where the clown Dimitri and his fellow artists, actors, musicians, dancers, jugglers, illusionists and animal tamers were able to present their shows. A buvette was attached to the theatre, and whether you just called in for a drink or two or maybe for a chat with an artist after his show, it became a stock exchange of ideas for patrons and artists alike. However, the first auditorium offered 100 seats only. Therefore, a permanent lack of space and financial difficulties were the order of the day. In 1978 the Compagnia Teatro Dimitri became a place where graduates and many former students gathered their first professional experience. Staged under the directions of Dimitri and other guest directors, close to 30 students have taken this unique chance and have appeared with great success in 25 theatre plays (see history) in Switzerland and abroad. Gradually, the original theatre has developed into quite a respectable enterprise, employing 25 people, as directors, secretaries, actors, stage managers, stage hands and maintenance staff. More than 150 performances, starring-tours and home productions go on stage in Verscio every year and have made it a brand name for a unique combination of tuition and practice in the art of theatre. The company is currently preparing a new performance. Inaugurated in August 2000, the Museum is the most recent of the Dimitri Foundation’s initiatives and the realisation of a long-held dream of Dimitri. The museum was set up by Harald Szeemann and contains exhibits of posters, photographs, musical instruments, objects, masks, sculptures, toys, clowns, and elephants of every type. All the articles on exhibit are directly connected with comic theatre, the circus, and the figure of the clown. There is also a projection of films by the greatest comedians, in particular “”Grock””, the king of clowns. 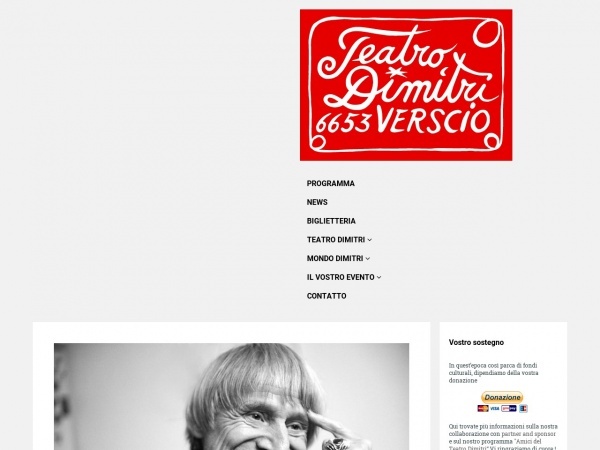 The foundation promotes and supports the activities of the Cooperative which directs the Dimitri Theatre and the Museum of Comedy in accordance with the guidelines laid down by its founder, Dimitri. The foundation places the buildings and property in its possession at the disposal of the Cooperative of the Dimitri Theatre which is responsible for the management of the above-mentioned institutions. Inasmuch as it can, the foundation contributes to the running expenses of the operating company. The foundation also supervises the adherence to the principles of the business profile which were developed by the foundation to safeguard the philosophy of its founder.